I never thought I’d ever write that line. 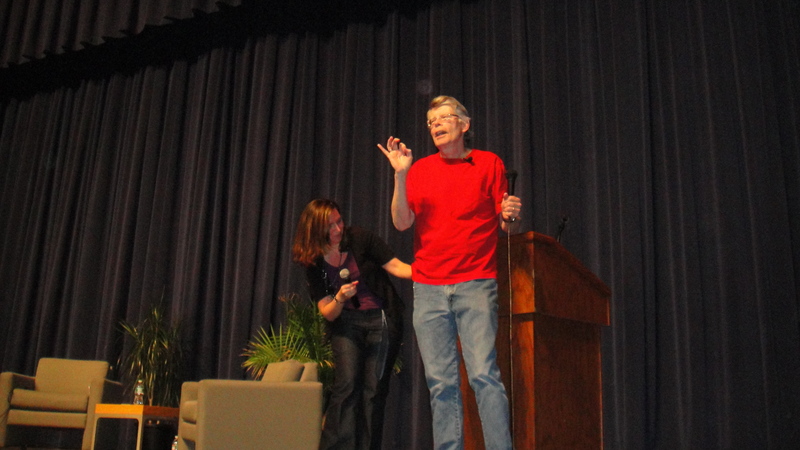 The prolific Stephen King, a man so ingrained in our cultural consciousness, popped into my high school yesterday for a visit. No fan fare. No press. Just Steve, rolling up in his Ford, new book Joyland in hand, clad in a baseball hat and t-shirt. Sorry to take so long to get back to you. I’ve had a chance to run this by Steve and he’d like to set up a visit to the school in May. Would you be able to give me a call at the office (207-999-9999) between 8:30 and 4 PM weekdays so that we can discuss this in more detail? And I did. And he came. We bought him lunch. A roast beef sandwich and a diet pepsi (not coke). We chatted for 40 minutes. 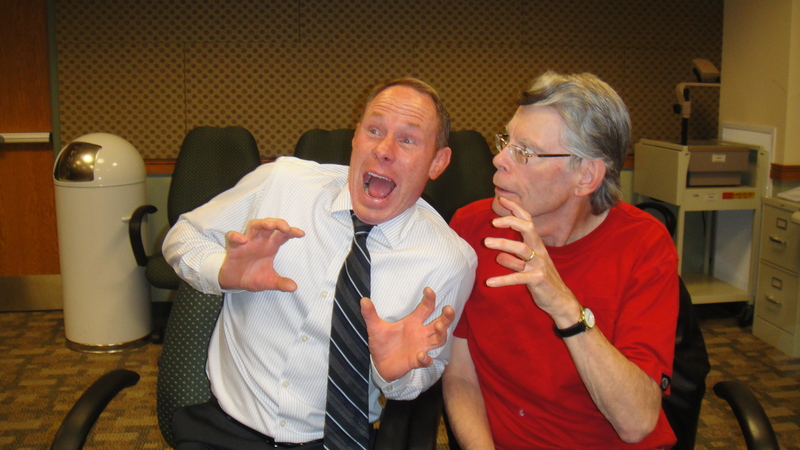 He signed a few books and took some funny pictures. He was amazing. Humble, funny, down-to-earth. After lunch, my Great Works class was invited in for a private session with him. I had lied to them for the past few months – they thought we were having an end of the year “party” and they thought King had agreed to answer questions (through email) they had generated earlier this month. They had no idea he’d be sitting in the room! He shook all of their hands, amidst tears, screams, and sheer, unadulterated joy. 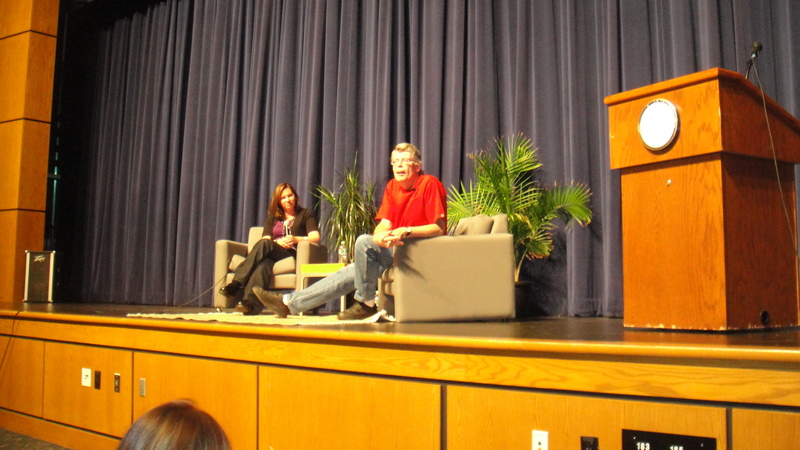 He explained how he got the idea for his novel, who inspired the characters (his favorite is Stu. He said he’d like to grow up to be Stu someday) and answered all my student’s questions. No, he didn’t like Molly Ringwald in the mini-series (she thought the role was beneath her, but the network insisted). And when he couldn’t remember a part from a novel he wrote 35 years ago, he simply said “I don’t know. What do you think?” The hour flew by and then it was off to the auditorium. 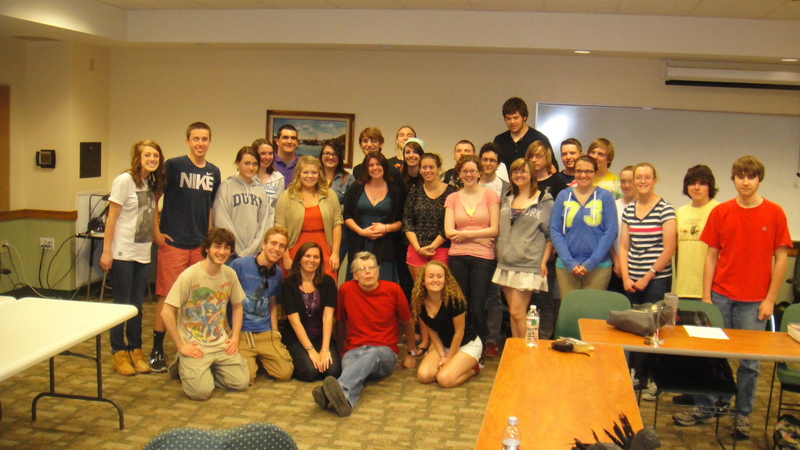 Earlier this year, three English teachers decided to run a series where they bring in local writers to talk to English classes about their craft. So far, we’ve met with a writer from the local university, a few from the local newspaper and an Iraq war vet who published a book of poems. 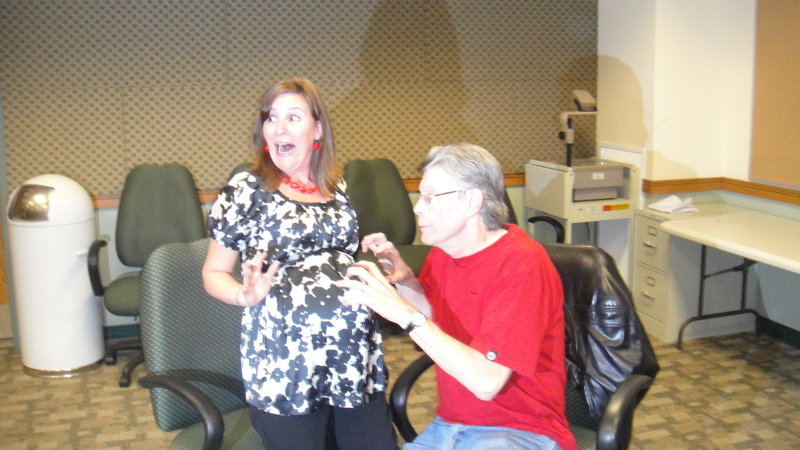 When I told King’s assistant about this program, she asked Steve if he’d be interested. He was. And he wanted to read to us from Joyland! I spent months trying to figure out what to say to introduce him. After all, no one could know it was him. How can I introduce a man of this magnitude to a group of teens that have no idea what they’re doing in the auditorium? Good afternoon everyone! Thank you very much for coming. I promise I will speak for less than two minutes. I know this, because I’ve timed it. I’ve been trying to figure out what I want to say for months now. I have the immeasurable honor of introducing our mystery guest speaker this afternoon, and I’ll be honest, I’m at a loss. I could rattle off facts about his life, like where he was born and how many novels he’s published. Because the fact is he’s everywhere: on TV and movie screens, on our bookshelves, and here, backstage, right now. He knows our deepest fears and desires, he knows the skeletons hidden in our closets, and the nightmares that drive us mad. The power of his novels lie in the fact that they feel so real – the heroes and villains are us. He is, quite literally, one of the best-selling authors of our lifetime. In fact, when you Google his name, you get 380 million results in less than half a second. So, herein lies my problem, what can I possibly say to you that would adequately convey the magnitude of this afternoon? Well, I can tell you this for sure. This author, who is about to take this stage, a man who is known throughout the world, has agreed to speak with us today and read an except from his latest novel, for only a roast beef sandwich and a Diet Pepsi. He is as humble and down to earth as he is famous and I am beyond excited to introduce him. 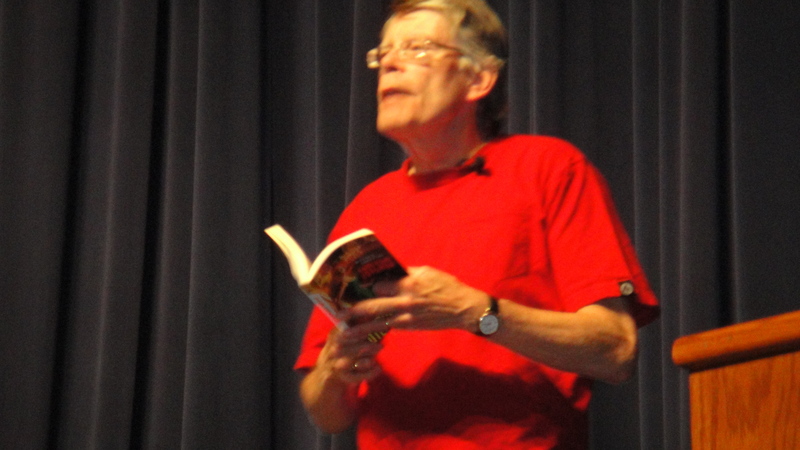 So now, without further ado, please join me in welcoming our esteemed Writer on an EHS Stage, Mr. Stephen King. And he took the stage. The screams from the crowd were enormous. They were shocked. He read to us for about 15 minutes. And spent the rest of the hour answering questions. 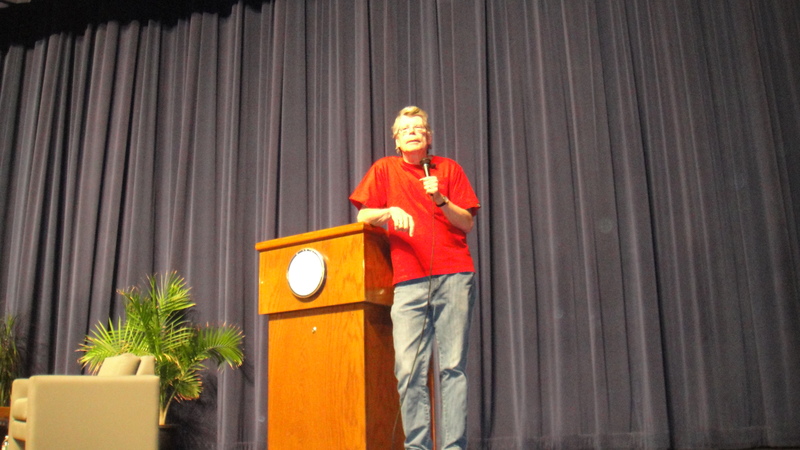 He was hilarious, sarcastic and a little dirty — when I had to help him turn the mic on he told the crowd that their teacher “turned him on”. The kids went crazy and my face turned 50 shades of red. Guilty Pleasure Book – he read 50 Shades of Grey, but it wasn’t that pleasurable. How much does he write a day – 1,000 words. Does he keep a Writer’s Notebook? No. He doesn’t want any evidence of bad writing. How do you become a writer? You write. A lot. And read. A lot. It’s one thing to have an idea for a novel, everyone has ideas, but it’s another thing entirely to write it. He made a joke about how if he had a nickel for every time someone told him they had an idea for a novel he’d be rich….well, he’s pretty rich already, but he’d be even richer. Perhaps the best part was when we asked him what message he wanted to leave the students of today with and he told them that if they could read and write well, they could own the world. So true. 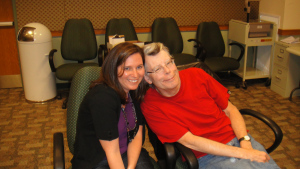 And thank you, Stephen King, for making my job easier. I’m still in shock that it happened the way it did. Like I said, no fan fare. And believe it or not, he was nervous to take that stage! What an amazing man and what an amazing day. 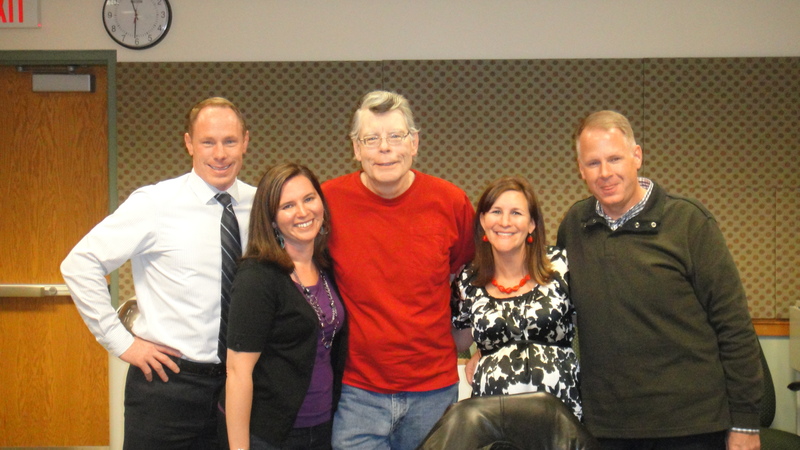 Thank you Stephen King for bringing my childhood dream to reality and for inspiring all those students today. Our world is better off for having you in it. (A student recorded King reading. You can view that video here).